Catch the big one or just catch a stunning sunset. In Coastal Alabama we offer so many great ways to enjoy your time on the water. 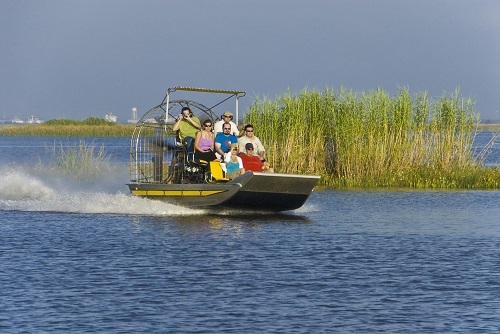 Get some serious wind in your hair with an airboat ride on the Mobile Delta. You can connect to the famous Bartram Canoe Trail in Mobile for a day of kayaking, canoeing and enjoying the Delta’s natural beauty where the Alabama and Tombigbee Rivers merge to form one of the most unique habitats in the world. The Mobile-Tensaw River Delta is the second largest river delta in the country and the largest in the state of Alabama. You can hop on an airboat, ride a pontoon, kayak and enjoy a day on the water. Located at the Fort of Colonial Mobile, the Gulf Coast Ducks Duck Boat Tour is sure to exceed even your highest expectations. Be entertained as energetic tour guides bring hilarity and fun to this interactive tour. Hop aboard the Gulf Coast’s only land and water tour to experience the Mobile River, Downtown Mobile, Mobile Bay and Battleship Park like you’ve never seen them before. Ride through more than 300 years of Mobile history including a real life Game of Thrones featuring stories of colonial powers battling for control over Mobile’s waterways. Get to know the dynamic characters and personalities that make Mobile one of the most unique cultures in the world. If ever there was a quintessential Eastern Shore photograph, it’s likely one of a beautiful sailboat gently flowing through Mobile Bay. Or perhaps dozens of them parked at the Grand Hotel marina, where sailors can rest a bit at a Robert Trent Jones Resort and Spa by the sea. Spanish Fort and the Mobile-Tensaw River Delta are home to the 5 Rivers Delta Resource Center, where both avid experts and amateurs alike can enjoy the water by canoe or kayak. You can even enjoy the Delta on a Delta Safari cruise. Take a Delta Explorer Cruise from the Historic Blakeley State Park. The park offers regular excursions into what is referred to by many as one of America’s natural wonders. Drop a line from the piers at Daphne’s May Day Park, Bayfront Park or the Village Point Park Preserve. There’s a reason renowned naturalist and ecologist Dr. E.O. Wilson calls Alabama’s Mobile-Tensaw Delta “the Amazon of the West.” There are plants and animals here that are rare or endangered, and one specific type of salamander considered a dinosaur—only lives in these pristine forests. North Baldwin’s Live Oak Landing or the Bartram Canoe Trail are both great places to start your adventure, and they are part of the Alabama Coastal Birding Trail. Orange Beach, Alabama, is arguably home to the largest deep-sea fishing charter boat fleets on the Gulf of Mexico. With turquoise waters, miles and miles of open seas and a number of natural and man-made fishing and scuba-diving spots, the area is a water baby’s dream. If a more relaxing ride is what you’re after, soak it all in on a dolphin cruise or a tranquil sailboat or catamaran sunset cruise. It’s the stuff dreams are made of. Not to be outdone by the Gulf, Orange Beach’s back bays offers fishing spots that also are amazing places to ski, raft or just anchor, dive in and float to your heart’s content. Lake Shelby at the Gulf State Park, is the world’s closest freshwater lake to an ocean or gulf, and visitors can rent kayaks or canoes and paddle the lake and it’s many cat-tail and saw grass-lined rivers and streams. Climb aboard a charter fishing boat and head out into the bountiful blue waters of the Gulf of Mexico from South Mobile’s Dauphin Island. While you’re out catching the big one, explore the light house, or take a ride on the Mobile Bay Ferry.